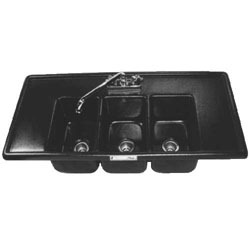 3 large basins to wash, rinse, and sanitize utensils. Each basin is large enough to submerge blender pitchers from virtually every manufacturer. Molded in one piece from quality A.B.S. plastic this durable unit gules easily into place, making installation easy. Complete with faucet and drain boards. Sink bowl size:6 1/2" x 12" x 6 1/2"
Drain board size: 6 1/4"x 14 3/4"
Overall size 17" x 36"